Cogeneration, sometimes known as combined heat and power (CHP), is the concept of generating heat and electricity together in a single device instead of generating them separately. As the name suggests, micro-cogeneration or micro-CHP is the application of cogeneration in a small scale to supply to a single home or building. For example, a micro-CHP system can be used to replace a gas boiler and provide both heat and electricity . Due to rising energy costs (particularly cost of electricity) and advancements in small heat engine and fuel cell technology in recent years, micro-cogeneration is becoming cost effective in many markets around the world . Depending on the definition, the term “micro-generation” covers designs that generate 5-50kW of electricity or less [4,5]. There are micro-CHP units based on several different technologies available today. These technologies include heat engines such as internal combustion engines, micro-turbines, and Stirling engines, and there are also micro-CHP units based on fuel cells . Each of these technologies has its own advantage and disadvantages, but in this subsection will focus on the application of Stirling engines in micro-CHP units. Stirling engines have several characteristics that make them suited to the application of micro-cogeneration. The first reason is that Stirling engines are relatively quiet during operation when compared to other heat engines . Stirling engines also have fewer moving parts and are easier to maintain than internal combustion engines, although micro-turbines and fuel cells have even fewer moving parts . The waste heat of Stirling engines is also easy to harvest and this is important for the heating portion of micro-CHP systems. Lastly, Stirling engines are very flexible in terms of fuel, being able to run on traditional fuels such as natural gas and renewable sources such as geothermal and solar . This characteristic also gives Stirling engine micro-CHP the potential to have very low emissions . On the downsides, micro-CHP systems based on Stirling engines are more expensive than internal combustion engine units . Stirling engines, especially the smaller and cheaper designs, also have low electrical efficiency (as low as 10%, vs. 20-25% for internal combustion engines) , although Stirling engine units have the potential to achieve high overall efficiency (heat + electricity) . One of the main reasons why a home/building owner would install a micro-CHP system is the potential for energy cost savings. Most of the savings from micro-CHP systems comes from the reduction of electricity consumption from the grid and the sale of excess electricity back to the grid . This is because micro-CHP systems in households and small buildings are typically driven by heat demand. The heat demand is usually more stable than the electricity demand, which means in many parts of the day the micro-CHP system will generate more electricity than the instant demand . With an implementation of net-metering, the home/building owner can feed the excess electricity back into the grid and lead to further savings in the electricity bill . This excess electricity sold back to the grid is more “efficient” that the electricity from central power stations, because the micro-CHP’s electricity is distributed and consumed locally and therefore suffers less transmission losses . By helping to reduce electricity consumption, micro-cogeneration can also help reduce carbon and pollutant emission, particularly if the central power plant uses coal or gas. Even if the micro-CHP uses the same fuels, the micro-CHP is more efficient because both the electricity and heat generated is used, while in a typical power plant the heat is dissipated as a waste product . On a broader scale, a wide deployment of micro-generation can help facilitate the introduction of intermittent generation such as solar or wind . The micro-CHP systems would serve as localized back-up capacity and reduce the backup generation that the utilities would have to keep . In the same sense, micro-CHP units can act as backup generators during a power outage . Having a lot of distributed generation also frees up transmission capacity for the utilities and reduces the need for new central power plants [4,5]. While micro-CHP systems have the potential to increase energy efficiency and reduce emissions, there are still many challenges that micro-CHP systems have to surmount before they can gain widespread usage. First of all, most micro-CHP systems (particularly high efficiency designs) are still too expensive by themselves . The electric bill savings can be minimal especially if the cost of electricity is not that expensive compared to the fuel used by the micro-CHP system. In order for the micro-CHP systems to be attractive to consumer, the purchase price has to be reduced  either through technological/manufacturing advancements or government initiatives. Another concern about micro-cogeneration is its impact on fuel supplies. As most current micro-CHP systems use natural gas, widespread deployment of these micro-CHP systems may lead to an increase in natural gas prices and/or cause disruptions in the supplies . An increase in natural gas prices would cut into any electric bill savings that these systems would provide. With fossil fuel prices predicted to increase and the trend towards renewable energy sources with lower carbon output, natural gas powered micro-CHP may only have a 20-30 year window of opportunity to proliferate . There are also concerns about the impact of micro-cogeneration on the electricity grid. While widespread micro-CHP deployment can benefit the grid by reducing transmission congestion and losses, it also brings a set of challenges for the grid operators. Possible issues arising from micro-cogeneration include increase in voltage variation, potential overloading of distribution equipment due to reverse power flow from the micro-CHP systems, and protection problems . Distribution networks will have to be upgraded in order to properly support widespread micro-CHP and other distributed generation. Lastly, micro-cogeneration requires a framework of policies and regulations to be in place in order to be successful. Governments have to implement policies to encourage the purchase of efficient energy systems such as micro-CHP and to promote innovation, and utilities need to support net metering so consumers can gain the economic benefits from their micro-CHP systems . The roll-out of micro-CHP systems or any other distributed generation needs to carefully planned out by governments and other relevant organizations so that society can gain the benefits in a timely manner. The progress of micro-cogeneration is differs greatly between different parts of the world. In North America, micro-cogeneration is still in the early stages of development. One of the main reasons for this lack of progress is that electricity in North America is cheap compared to many parts of the world, and therefore there is less economic pressure to move to more efficient equipment . Another factor is the proliferation of forced-air furnaces for space-heating. Most micro-CHP units are designed to replace European-style boilers which are more expensive than furnaces, and therefore using a micro-CHP system to replace a furnace is not economically attractive . Finally, micro-cogeneration in North America is impeded by the lack of government policy and the fragmented electricity market . It’s harder for new equipment such as micro-CHP systems to gain a foothold when there are so many utilities each having their own policies. In comparison to North America, micro-cogeneration has progressed much further in markets such as the United Kingdoms and Japan. In the UK, gas and electricity provider E.ON (formerly Powergen) offers a 1kWe Stirling engine micro-CHP unit and plans to have 80,000 units installed by 2010 . The UK government also provides support for the micro-CHP initiative by reducing the VAT on these systems from 17.5% to 5% . In Japan, 90,000 micro-CHP units have been sold from 2003-2009 with most of these units powered by internal combustion engines . Several Japanese utilities including Tokyo Gas are also releasing fuel cell based systems, and Tokyo Gas expects to sell 2100 of these units in the first year . Whisper Tech (http://www.whispergen.com) is a company that manufactures micro-CHP units for European markets, and the company’s WhisperGen model is available for sale in the UK from the gas utility E.ON [4,9]. The WhisperGen unit is powered by a four cylinder Stirling engine and runs on natural gas . 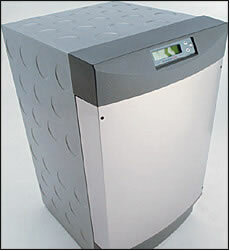 The unit is rated for 1kW electricity and 7.5kW thermal output, and it is about the size of a house-hold dishwasher . The WhisperGen unit costs £3,000 including VAT and installation when purchased from E.ON , and this price is about £500-600 more than a high-efficiency condensing gas boiler that the WhisperGen would replace [5,10]. E.ON estimates that the WhisperGen will lead to £150/yr in utility bill savings and a reduction of up to 1.5 tonnes per year in carbon dioxide emissions .